Written for the Initial Release of the Next Scripting Framework. This document provides a tutorial for the Next Scripting Language NX. The Next Scripting Language (NX) is a highly flexible object oriented scripting language based on Tcl [Ousterhout 1990]. NX is a successor of XOTcl 1 [Neumann and Zdun 2000a] and was developed based on 10 years of experience with XOTcl in projects containing several hundred thousand lines of code. While XOTcl was the first language designed to provide language support for design patterns, the focus of the Next Scripting Framework and NX is on combining this with Language Oriented Programming. In many respects, NX was designed to ease the learning of the language for novices (by using a more mainstream terminology, higher orthogonality of the methods, less predefined methods), to improve maintainability (remove sources of common errors) and to encourage developers to write better structured programs (to provide interfaces) especially for large projects, where many developers are involved. The Next Scripting Language is based on the Next Scripting Framework (NSF) which was developed based on the notion of language oriented programming. The Next Scripting Frameworks provides C-level support for defining and hosting multiple object systems in a single Tcl interpreter. The name of the Next Scripting Framework is derived from the universal method combinator "next", which was introduced in XOTcl. The combinator "next" serves as a single instrument for method combination with filters, per-object and transitive per-class mixin classes, object methods and multiple inheritance. The definition of NX is fully scripted (e.g. defined in nx.tcl). The Next Scripting Framework is shipped with three language definitions, containing NX and XOTcl 2. Most of the existing XOTcl 1 programs can be used without modification in the Next Scripting Framework by using XOTcl 2. The Next Scripting Framework requires Tcl 8.5 or newer. 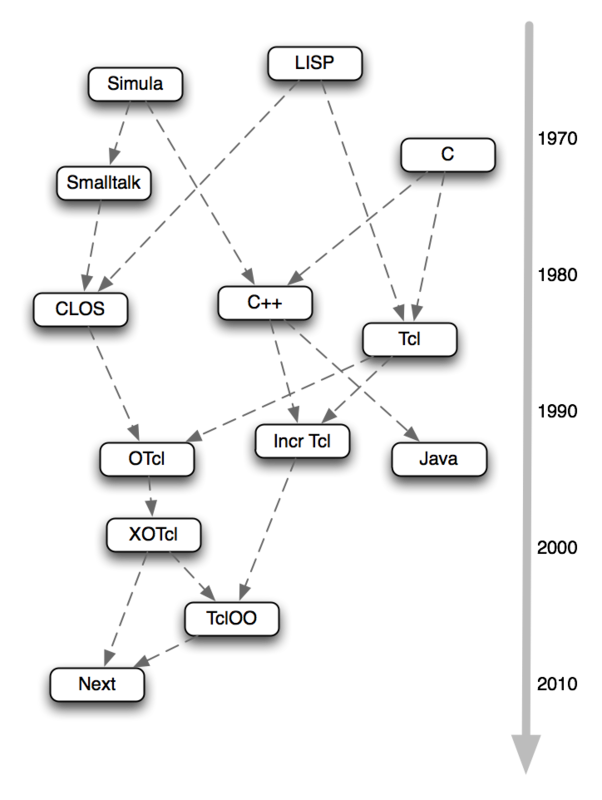 Object oriented extensions of Tcl have quite a long history. Two of the most prominent early Tcl based OO languages were incr Tcl (abbreviated as itcl) and Object Tcl (OTcl [Wetherall and Lindblad 1995]). While itcl provides a traditional C++/Java-like object system, OTcl was following the CLOS approach and supports a dynamic object system, allowing incremental class and object extensions and re-classing of objects. Extended Object Tcl (abbreviated as XOTcl [Neumann and Zdun 2000a]) is a successor of OTcl and was the first language providing language support for design patterns. XOTcl extends OTcl by providing namespace support, adding assertions, dynamic object aggregations, slots and by introducing per-object and per-class filters and per-object and per-class mixins. XOTcl was so far released in more than 30 versions. It is described in its detail in more than 20 papers and serves as a basis for other object systems like TclOO [Donal ???]. The scripting language NX and the Next Scripting Framework [Neumann and Sobernig 2009] extend the basic ideas of XOTcl by providing support for language-oriented programming. The the Next Scripting Framework supports multiple object systems concurrently. Effectively, every object system has different base classes for creating objects and classes. Therefore, these object systems can have different interfaces and can follow different naming conventions for built-in methods. Currently, the Next Scripting Framework is packaged with three object systems: NX, XOTcl 2.0, and TclCool (the language introduced by TIP#279). The primary purpose of this document is to introduce NX to beginners. We expect some prior knowledge of programming languages, and some knowledge about Tcl. In the following sections we introduce NX by examples. In later sections we introduce the more advanced concepts of the language. Conceptually, most of the addressed concepts are very similar to XOTcl. Concerning the differences between NX and XOTcl, please refer to the Migration Guide for the Next Scripting Language. A classical programming example is the implementation of a stack, which is most likely familiar to many readers from many introductory programming courses. A stack is a last-in first-out data structure which is manipulated via operations like push (add something to the stack) and pop remove an entry from the stack. These operations are called methods in the context of object oriented programming systems. Primary goals of object orientation are encapsulation and abstraction. Therefore, we define a common unit (a class) that defines and encapsulates the behavior of a stack and provides methods to a user of the data structure that abstract from the actual implementation. 2.1. 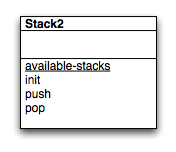 Define a Class "Stack"
In our first example, we define a class named Stack with the methods push and pop. When an instance of the stack is created (e.g. a concrete stack s1) the stack will contain an instance variable named things, initialized with the an empty list. Typically, classes are defined in NX via nx::Class create, followed by the name of the new class (here: Stack). The definition of the stack placed between curly braces and contains here just the method definitions. Methods of the class are defined via :method followed by the name of the method, an argument list and the body of the method, consisting of Tcl and NX statements. When an instance of Stack is created, it will contain an instance variable named things. If several Stack instances are created, each of the instances will have their own (same-named but different) instance variable. The instance variable things is used in our example as a list for the internal representation of the stack. We define in a next step the methods to access and modify this list structure. A user of the stack using the provided methods does not have to have any knowledge about the name or the structure of the internal representation (the instance variable things). The method push receives an argument thing which should be placed on the stack. Note that we do not have to specify the type of the element on the stack, so we can push strings as well as numbers or other kind of things. When an element is pushed, we add this element as the first element to the list things. We insert the element using the Tcl command linsert which receives the list as first element, the position where the element should be added as second and the new element as third argument. To access the value of the instance variable we use Tcl’s dollar operator followed by the name. The names of instance variables are preceded with a colon :. Since the name contains a non-plain character, Tcl requires us to put braces around the name. The command linsert and its arguments are placed between square brackets. This means that the function linsert is called and a new list is returned, where the new element is inserted at the first position (index 0) in the list things. The result of the linsert function is assigned again to the instance variable things, which is updated this way. Finally the method push returns the pushed thing using the return statement. The method pop returns the most recently stacked element and removes it from the stack. Therefore, it takes the first element from the list (using the Tcl command lindex), assigns it to the method-scoped variable top, removes the element from the instance variable things (by using the Tcl command lrange) and returns the value popped element top. This finishes our first implementation of the stack, more enhanced versions will follow. Note that the methods push and pop are defined as public; this means that these methods can be used from all other objects in the system. Therefore, these methods provide an interface to the stack implementation. Now we want to use the stack. The code snippet in Listing 3 shows how to use the class Stack in a script. Since NX is based on Tcl, the script will be called with the Tcl shell tclsh. In the Tcl shell we have to require package nx to use the Next Scripting Framework and NX. The next lines contain the definition of the stack as presented before. Of course, it is as well possible to make the definition of the stack an own package, such we could simple say package require stack, or to save the definition of a stack simply in a file and load it via source. In line 12 we create an instance of the stack, namely the stack object s1. The object s1 is an instance of Stack and has therefore access to its methods. The methods like push or pop can be invoked via a command starting with the object name followed by the method name. In lines 13-15 we push on the stack the values a, then b, and c. In line 16 we output the result of the pop method using the Tcl command puts. We will see on standard output the value+c+ (the last stacked item). The output of the line 17 is the value b (the previously stacked item). Finally, in line 18 we destroy the object. This is not necessary here, but shows the life cycle of an object. In some respects, destroy is the counterpart of create from line 12. 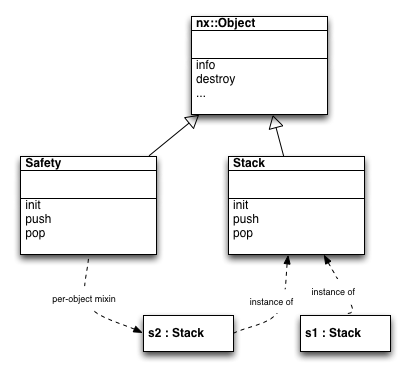 Figure 4 shows the actual class and object structure of the first Stack example. Note that the common root class is nx::Object that contains methods for all objects. Since classes are as well objects in NX, nx::Class is a specialization of nx::Object. nx::Class provides methods for creating objects, such as the method create which is used to create objects (and classes as well). 2.2. Define an Object Named "stack"
The definition of the stack in Listing 2 follows the traditional object oriented approach, found in practically every object oriented programming language: Define a class with some methods, create instances from this class, and use the methods defined in the class in the instances of the class. In our next example, we introduce generic objects and object specific methods. With NX, we can define generic objects, which are instances of the most generic class nx::Object (sometimes called common root class). nx::Object is predefined and contains a minimal set of methods applicable to all NX objects. In this example, we define a generic object named stack and provide methods for this object. The methods defined above were methods provided by a class for objects. Now we define object specific methods, which are methods applicable only to the object for which they are defined. 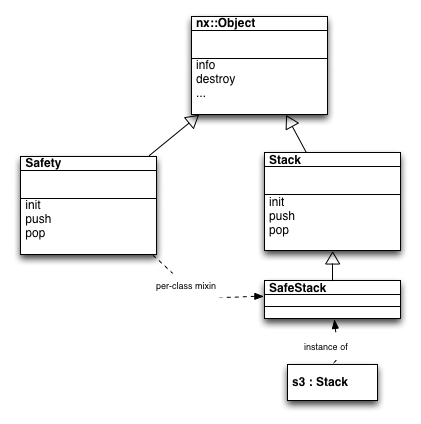 The example in Listing 5 defines the object stack in a very similar way as the class Stack. But the following points are different. First, we use nx::Object instead of nx::Class to denote that we want to create a generic object, not a class. We use :object variable to define the variable things just for this single instance (the object stack). The definition for the methods push and pop are the same as before, but here we defined these with object method. Therefore, these two methods push and pop are object-specific. In order to use the stack, we can use directly the object stack in the same way as we have used the object s1 in Listing 3 the class diagram for this the object stack. A reader might wonder when to use a class Stack or rather an object stack. A big difference is certainly that one can define easily multiple instances of a class, while the object is actually a single, tailored entity. The concept of the object stack is similar to a module, providing a certain functionality via a common interface, without providing the functionality to create multiple instances. The reuse of methods provided by the class to objects is as well a difference. If the methods of the class are updated, all instances of the class will immediately get the modified behavior. However, this does not mean that the reuse for the methods of stack is not possible. NX allows for example to copy objects (similar to prototype based languages) or to reuse methods via e.g. aliases (more about this later). Note that we use capitalized names for classes and lowercase names for instances. This is not required and a pure convention making it easier to understand scripts without much analysis. So far, the definition of the stack methods was pretty minimal. Suppose, we want to define "safe stacks" that protect e.g. against stack under-runs (a stack under-run happens, when more pop than push operations are issued on a stack). Safety checking can be implemented mostly independent from the implementation details of the stack (usage of internal data structures). There are as well different ways of checking the safety. Therefore we say that safety checking is orthogonal to the stack core implementation. With NX we can define stack-safety as a separate class using methods with the same names as the implementations before, and "mix" this behavior into classes or objects. The implementation of Safety in stack under-runs and to issue error messages, when this happens. # as the methods of Stack; these methods "shadow"
# the methods of class Stack. Note that all the methods of the class Safety end with next. This command is a primitive command of NX, which calls the same-named method with the same argument list as the current invocation. Assume we save the definition of the class Stack in a file named Stack.tcl and the definition of the class Safety in a file named Safety.tcl in the current directory. When we load the classes Stack and Safety into the same script (see the terminal dialog in e.g. a certain stack s2 as a safe stack, while all other stacks (such as s1) might be still "unsafe". This can be achieved via the option -mixin at the object creation time (see line 9 in option -mixin mixes the class Safety into the new instance s2. When the method push of s2 is called, first the method of the mixin class Safety will be invoked that increments the counter and continues with next to call the shadowed method, here the method push of the Stack implementation that actually pushes the item. The same happens, when s2 pop is invoked, first the method of Safety is called, then the method of the Stack. When the stack is empty (the value of count reaches 0), and pop is invoked, the mixin class Safety generates an error message (raises an exception), and does not invoke the method of the Stack. The last two commands in Listing 8 use introspection to query for the objects s1 and s2 in which order the involved classes are processed. This order is called the precedence order and is obtained via info precedence. We see that the mixin class Safety is only in use for s2, and takes there precedence over Stack. The common root class nx::Object is for both s1 and s2 the base class. Note that in Listing 8, the class Safety is only mixed into a single object (here s2), therefore we refer to this case as a per-object mixin. Figure 9 shows the class diagram, where the class Safety is used as a per-object mixin for s2. The difference of a per-class mixin and an per-object mixin is that the per-class mixin is applicable to all instances of the class. Therefore, we call these mixins also sometimes instance mixins. In our example in Listing 10, Safety is mixed into the definition of SafeStack. Therefore, all instances of the class SafeStack (here the instance s3) will be using the safety definitions. Figure 11 shows the class diagram for this definition. Note that we could use Safety as well as a per-class mixin on Stack. In this case, all stacks would be safe stacks and we could not provide a selective feature selection (which might be perfectly fine). The definition of Stack is generic and allows all kind of elements to be stacked. Suppose, we want to use the generic stack definition, but a certain stack (say, stack s4) should be a stack for integers only. This behavior can be achieved by the same means as introduced already in Listing 5, namely object-specific methods. The program snippet in Listing 12 defines an instance s4 of the class Stack and provides an object specific method for push to implement an integer stack. The method pull is the same for the integer stack as for all other stacks, so it will be reused as usual from the class Stack. The object-specific method push of s4 has a value constraint in its argument list (thing:integer) that makes sure, that only integers can be stacked. In case the argument is not an integer, an exception will be raised. Of course, one could perform the value constraint checking as well in the body of the method proc by accepting an generic argument and by performing the test for the value in the body of the method. In the case, the passed value is an integer, the push method of Listing 12 calls next, and therefore calls the shadowed generic definition of push as provided by Stack. An alternative approach is shown in Listing 13, where the class IntegerStack is defined, using the same method definition as s4, this time on the class level. In our previous examples we defined methods provided by classes (applicable for their instances) and object-specific methods (methods defined on objects, which are only applicable for these objects). In this section, we introduce methods that are defined on the class objects. Such methods are sometimes called class methods or static methods. In NX classes are objects, they are specialized objects with additional methods. Methods for classes are often used for managing the life-cycles of the instances of the classes (we will come to this point in later sections in more detail). Since classes are objects, we can use exactly the same notation as above to define class methods by using object method. The methods defined on the class object are in all respects identical with object specific methods shown in the examples above. The class Stack2 in Listing 14 consists of the earlier definition of the class Stack and is extended by the class-specific method available_stacks, which returns the current number of instances of the stack. The final command puts (line 26) prints 2 to the console. 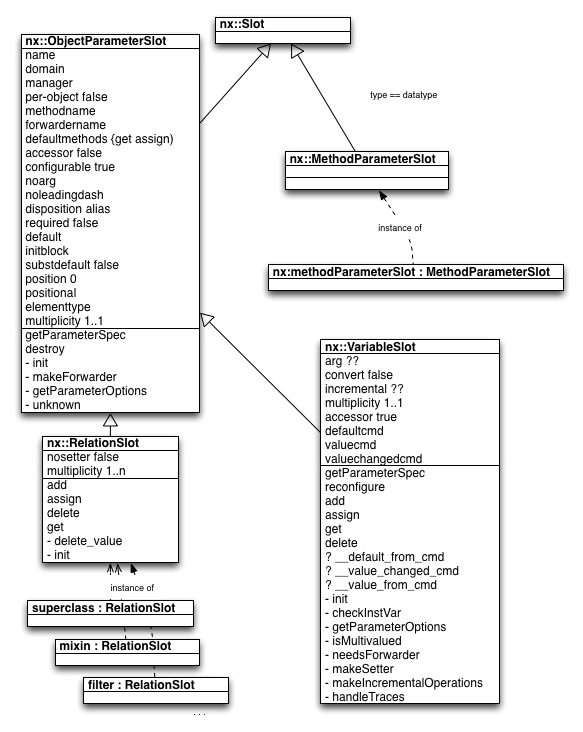 The class diagram in Figure 15 shows the diagrammatic representation of the class object-specific method available_stacks. 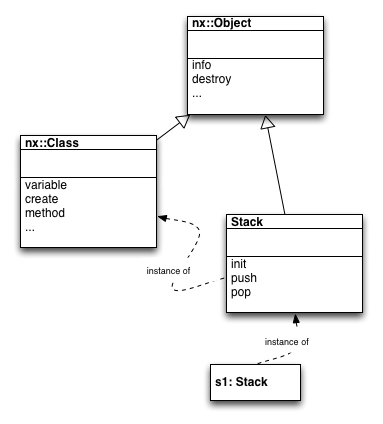 Since every class is a specialization of the common root class nx::Object, the common root class is often omitted from the class diagrams, so it was omitted here as well in the diagram. A variable without any colon prefix refers typically to a method scoped variable. Such a variable is created during the invocation of the method, and it is deleted, when the method ends. In the example below, the variable a is method scoped. A variable with a single colon prefix refers to an instance variable. An instance variable is part of the object; when the object is destroyed, its instance variables are deleted as well. In the example below, the variable b is an instance variable. A variable with two leading colons refers to a global variable. The lifespan of a globale variable ends when the variable is explicitly unset or the script terminates. Variables, which are placed in Tcl namespaces, are also global variables. In the example below, the variable c is a global variable. Listing 16 shows a method foo of some class Foo referring to differently scoped variables. As described above, there is no need to declare instance variables in NX. In many cases, a developer might want to define some value constraints for variables, or to provide defaults, or to make variables configurable upon object creation. Often, variables are "inherited", meaning that the variables declared in a general class are also available in a more specialized class. For these purposes NX provides variable handlers responsible for the management of instance variables. We distinguish in NX between configurable variables (called property) and variables that are not configurable (called variable). A property is a definition of a configurable instance variable. The term configurable means that (a) one can provide at creation time of an instance a value for this variable, and (b), one can query the value via the accessor function cget and (c), one can change the value of the variable via configure at runtime. Since the general accessor function cget and configure are available, an application developer does not have to program own accessor methods. When value checkers are provided, each time, the value of the variable is to be changed, the constrained are checked as well. 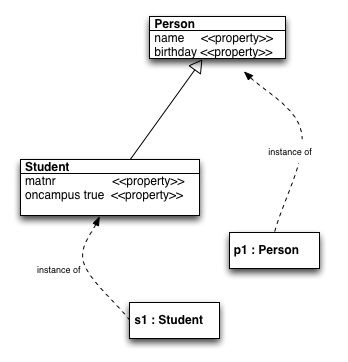 The class diagram above defines the classes Person and Student. For both classes, configurable instance variable are specified by defining these as properties. The listing below shows an implementation of this conceptual model in NX. # Define a class Person with properties "name"
puts "The name of s1 is [s1 cget -name]"
By defining name and birthday as properties of Person, NX makes these configurable. When we create an instance of Person named p1, we can provide a value for e.g. the name by specifying -name during creation. The properties result in non-positional configure parameters which can be provided in any order. In our listing, we create an instance of Person using the configure parameter name and provide the value of Bob to the instance variable name. The class Student is defined as a specialization of Person with two additional properties: matnr and oncampus. The property matnr is required (it has to be provided, when an instance of this class is created), and the property oncampus is boolean, and is per default set to true. Note that the class Student inherits the properties of Person. So, Student has four properties in total. The property definitions provide the configure parameters for instance creation. Many other languages require such parameters to be passed via arguments of a constructor, which is often error prone, when values are to be passed to superclasses. Also in dynamic languages, the relationships between classes can be easily changed, and different superclasses might have different requirements in their constructors. The declarative approach in NX reduces the need for tailored constructor methods significantly. Note, that the property matnr of class Student is required. This means, that if we try to create an instance of Student, a runtime exception will be triggered. The property oncamups is boolean and contains a default value. Providing a default value means that whenever we create an instance of this class the object will contain such an instance variable, even when we provide no value via the configure parameters. In our listing, we create an instance of Student using the two configure parameters name and matnr. Finally, we use method cget to obtain the value of the instance variable name of object s1. In practice, not all instance variables should be configurable. But still, we want to be able to provide defaults similar to properties. To define non-configurable instance variables the predefined method variable can be used. Such instance variables are often used for e.g. keeping the internal state of an object. The usage of variable is in many respects similar to property. One difference is, that property uses the same syntax as for method parameters, whereas variable receives the default value as a separate argument (similar to the variable command in plain Tcl). The introductory Stack example in Listing 2 uses already the method variable. Note that the variable definitions are inherited in the same way as properties. The example in Listing 19 shows a class Derived that inherits from Base. When an instance d1 is created, it will contain the two instance variables x and y. Note that the variable declarations from property and variable are used to initialize (and to configure) the instances variables of an object. In many other object oriented languages, the instance variables are initialized solely by the constructor (similar to class Derived2 in Listing 20). This approach is certainly also possible in NX. Note that the approach using constructors requires an explicit method chaining between the constructors and is less declarative than the approach in NX using property and variable. Both, property and variable provide much more functionalities. One can for example declare public, protected or private accessor methods, or one can define variables to be incremental (for e.g. adding values to a list of values), or one can define variables specific behavior. The basic building blocks of an object oriented program are object and classes, which contain named pieces of code, the methods. Methods are subroutines (pieces of code) associated with objects and/or classes. A method has a name, receives optionally arguments during invocation and returns a value. Plain Tcl provides subroutines, which are not associated with objects or classes. Tcl distinguishes between +proc+s (scripted subroutines) and commands (system-languages implemented subroutines). Methods might have different scopes, defining, on which kind of objects these methods are applicable to. These are described in more detail later on. For the time being, we deal here with methods defined on classes, which are applicable for the instance of these classes. Since NX is a scripting language, most methods are most likely scripted methods, in which the method body contains Tcl code. puts "[self] Bark, bark, bark." # The following line prints "::fido Bark, bark, bark." In the example above we create a class Dog with a scripted method named bark. The method body defines the code, which is executed when the method is invoked. In this example, the method bar prints out a line on the terminal starting with the object name (this is determined by the built in command self) followed by "Bark, bark, bark.". This method is defined on a class and applicable to instances of the class (here the instance fido). Not all of the methods usable in NX are scripted methods; many predefined methods are defined in the underlying system language, which is typically C. For example, in Listing 21 we used the method create to create the class Dog and to create the dog instance fido. These methods are implemented in C in the next scripting framework. C-implemented methods are not only provided by the underlying framework but might be as well defined by application developers. This is an advanced topic, not covered here. However, application developer might reuse some generic C code to define their own C-implemented methods. Such methods are for example accessors, forwarders and aliases. An accessor method is a method that accesses instance variables of an object. A call to an accessor without arguments uses the accessor as a getter, obtaining the actual value of the associated variable. A call to an accessor with an argument uses it as a setter, setting the value of the associated variable. NX provides support for C-implemented accessor methods. Accessors have already been mentioned in the section about properties. When the option -accessor public|protected|private is provided to a variable or property definition, NX creates automatically a same-named accessors method. Listing 22 shows an extended example, where every dog has a tail. The object tail is created as a subobject of the dog in the constructor init. The subobject can be accessed by providing the full name of the subobject fido::tail. The method length is an C-implemented accessor, that enforces the value constraint (here a floating point number, since length uses the value constraint double). Line 25 will therefore raise an exception, since the provided values cannot be converted to a double number. # The invocation of "fido wag" is delegated to "fido::tail wag". # Therefore, the following method returns "Joy". Listing 23 again extends the example by adding a forwarder named wag to the object (e.g. fido). The forwarder redirects all calls of the form fido wag with arbitrary arguments to the subobject fido::tail. A forwarder method is a C-implemented method that redirects an invocation for a certain method to either a method of another object or to some other method of the same object. Forwarding an invocation of a method to some other object is a means of delegation. The functionality of the forwarder can just as well be implemented as a scripted method, but for the most common cases, the forward implementation is more efficient, and the forward method expresses the intention of the developer. The method forwarder has several options to change e.g. the order of the arguments, or to substitute certain patterns in the argument list etc. This will be described in later sections. An alias method is a means to register either an existing method, or a Tcl proc, or a Tcl command as a method with the provided name on a class or object. In some way, the method alias is a restricted form of a forwarder, though it does not support delegation to different objects or argument reordering. The advantage of the method alias compared to a forwarder is that it has close to zero overhead, especially for aliasing c-implemented methods. # Define a public alias for the method "bark"
Listing 24 extends the last example by defining an alias for the method bark. The example only shows the bare mechanism. In general, method aliases are very powerful means for reusing pre-existing functionality. The full object system of NX and XOTcl2 is built from aliases, reusing functionality provided by the next scripting framework under different names. Method aliases are as well a means for implementing traits in NX. All kinds of methods might have different kind of protections in NX. The call-protection defines from which calling context methods might be called. The Next Scripting Framework supports as well redefinition protection for methods. NX distinguishes between public, protected and private methods, where the default call-protection is protected. A public method can be called from every context. A protected method can only be invoked from the same object. A private method can only be invoked from methods defined on the same entity (defined on the same class or on the same object) via the invocation with the local flag (i.e. ": -local foo"). All kind of method protections are applicable for all kind of methods, either scripted or C-implemented. The distinction between public and protected leads to interfaces for classes and objects. Public methods are intended for consumers of these entities. Public methods define the intended ways of providing methods for external usages (usages, from other objects or classes). Protected methods are intended for the implementor of the class or subclasses and not for public usage. The distinction between protected and public reduces the coupling between consumers and the implementation, and offers more flexibility to the developer. The example above uses :protected method helper …. We could have used here as well :method helper …, since the default method call-protection is already protected. The base class implements a public method foo using the helper method named helper. The derived class implements a as well a public method bar, which is also using a helper method named helper. When an instance s1 is created from the derived class, the method foo is invoked which uses in turn the private method of the base class. Therefore, the invocation s1 foo 3 4 returns its sum. If the local flag had not beed used in helper, s1 would have tried to call the helper of Sub, which would be incorrect. For all other purposes, the private methods are "invisible" in all situations, e.g., when mixins are used, or within the next-path, etc. By using the -local flag at the call site it is possible to invoke only the local definition of the method. If we would call the method without this flag, the resolution order would be the standard resolution order, starting with filters, mixins, object methods and the full intrinsic class hierarchy. NX supports the modifier private for methods and properties. In all cases private is an instrument to avoid unanticipated interactions and means actually "accessible for methods defined on the same entity (object or class)". The main usage for private is to improve locality of the code e.g. for compositional operations. In order to improve locality for properties, a private property defines therefore internally a variable with a different name to avoid unintended interactions. The variable should be accessed via the private accessor, which can be invoked with the -local flag. In the following example class D introduces a private property with the same name as a property in the superclass. # Define a subclass D with a private property "x"
puts [d1 x get]   ;# prints "c"
puts [d1 bar x]   ;# prints "d"
Without the private definition of the property, the definition of property x in class D would shadow the definition of the property in the superclass C for its instances (d1 x or set :x would return d instead of c). As defined above, a method is a subroutine defined on an object or class. This object (or class) contains the method. If the object (or class) is deleted, the contained methods will be deleted as well. Typically, methods are defined on a class, and the methods defined on the class are applicable to the instances (direct or indirect) of this class. These methods are called instance methods. In the following example method, foo is an instance method defined on class C.
# Method "foo" is defined on class "C"
# and applicable to the instances of "C"
There are many programming languages that only allow these types of methods. However, NX also allows methods to be defined on objects. Methods defined on objects are object methods. Object methods are only applicable on the object, on which they are defined. Object methods cannot be inherited from other objects. The following example defines an object method bar on the instance c1 of class C, and as well as the object specific method baz defined on the object o1. An object method is defined via object method. Note that we can define a object method that shadows (redefines) for this object methods provided from classes. # Method "bar" is an object specific method of "c1"
# Method "baz" is an object specific method of "o1"
A class method is a method defined on a class, which is only applicable to the class object itself. The class method is actually an object method of the class object. In NX, all classes are objects. Classes are in NX special kind of objects that have e.g. the ability to create instances and to provide methods for the instances. Classes manage their instances. The general method set for classes is defined on the meta-classes (more about this later). The following example defines a public class method bar on class C. The class method is specified by using the modifier object in front of method in the method definition command. # Method "bar" is a class method of class "C"
# therefore applicable on the class object "C"
# Method "foo" is an instance method of "C"
# therefore applicable on instance "c1"
# instance, an error will be raised. In some other object-oriented programming languages, class methods are called "static methods". NX provides ensemble methods as a means to structure the method name space and to group related methods. Ensemble methods are similar in concept to Tcl’s ensemble commands. An ensemble method is a form of a hierarchical method consisting of a container method and sub-methods. The first argument of the container method is interpreted as a selector (the sub-method). Every sub-method can be an container method as well. Ensemble methods provide a means to group related commands together, and they are extensible in various ways. It is possible to add sub-methods at any time to existing ensembles. Furthermore, it is possible to extend ensemble methods via mixin classes. The following example defines an ensemble method for string. An ensemble method is defined when the provide method name contains a space. # "length", "tolower" and "info"
c1 string length "hello world"
In the case, no mixins are involved, first the object is searched for an object method with the given name, and then the class hierarchy of the object. The method can be defined multiple times on the search path, so some of these method definitions might be shadowed by the more specific definitions. 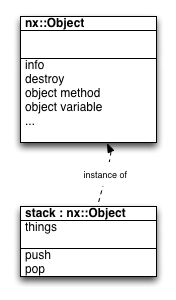 # result: "d1 foo: D foo: C foo: "
# result: "::D ::C ::nx::Object"
Consider the example in Listing 32. When the method foo is invoked on object d1, the object method has the highest precedence and is therefore invoked. The object methods shadows the same-named methods in the class hierarchy, namely the method foo of class D and the method foo of class C. The shadowed methods can be still invoked, either via the primitive next or via method handles (we used already method handles in the section about method aliases). In the example above, next calls the shadowed method and add their results to the results of every method. So, the final result contains parts from d1, D and C. Note, that the topmost next in method foo of class C shadows no method foo and simply returns empty (and not an error message). The introspection method info precedence provides information about the order, in which classes processed during method resolution. # Add the methods from "M1" as per-object mixin to "d1"
# Add the methods from "M2" as per-class mixin to class "C"
# result: "M1 foo: M2 foo: d1 foo: D foo: C foo: "
# result: "::M1 ::M2 ::D ::C ::nx::Object"
The example in Listing 33 is an extension of the previous example. We define here two additional classes M1 and M2 which are used as per-object and per-class mixins. Both classes define the method foo, these methods shadow the definitions of the intrinsic class hierarchy. Therefore an invocation of foo on object d1 causes first an invocation of method in the per-object mixin. # the mixins "M1" and "M2" are registered. # Invoke the method "bar"
In the first line of the body of method bar, the method foo is called as usual with an implicit receiver, which defaults to the current object (therefore, the call is equivalent to d1 foo). The next three calls show how to provide flags that influence the method resolution. The flags can be provided between the colon and the method name. These flags are used rather seldom but can be helpful in some situations. The invocation flag -local means that the method has to be resolved from the same place, where the current method is defined. Since the current method is defined as a object method, foo is resolved as a object method. The effect is that the mixin definitions are ignored. The invocation flag -local was already introduced int the section about method protection, where it was used to call private methods. The invocation flag -intrinsic means that the method has to be resolved from the intrinsic definitions, meaning simply without mixins. The effect is here the same as with the invocation flag -local. The invocation flag -system means that the method has to be resolved from basic - typically predefined - classes of the object system. This can be useful, when script overloads system methods, but still want to call the shadowed methods from the base classes. In our case, we have no definitions of foo on the base clases, therefore an error message is returned. Before we discuss method and configure parameters in more detail, we describe the parameter features in the subsequent sections based on method parameters. If the position of a parameter in the list of formal arguments (e.g. passed to a function) is significant for its meaning, this is a positional parameter. If the meaning of the parameter is independent of its position, this is a non-positional parameter. When we call a method with positional parameters, the meaning of the parameters (the association with the argument in the argument list of the method) is determined by its position. When we call a method with non-positional parameters, their meaning is determined via a name passed with the argument during invocation. puts "x? [info exists x] y? [info exists y] a=$a"
Consider the example in Listing 35. The method foo has the argument list x y. This means that the first argument is passed in an invocation like o1 foo 1 2 to x (here, the value 1), and the second argument is passed to y (here the value 2). Method bar has in contrary just with non-positional arguments. Here we pass the names of the parameter together with the values. In the invocation o1 bar -y 3 -x 1 the names of the parameters are prefixed with a dash ("-"). No matter whether in which order we write the non-positional parameters in the invocation (see line 30 and 31 in Listing 35) in both cases the variables x and y in the body of the method bar get the same values assigned (x becomes 1, y becomes 3). It is certainly possible to combine positional and non-positional arguments. Method baz provides two non-positional parameter (-y and -y) and one positional parameter (namely a). The invocation in line 34 passes the value of 1 to x and the value of 100 to a. There is no value passed to y, therefore value of y will be undefined in the body of baz, info exists y checks for the existence of the variable y and returns 0. The invocation in line 35 passes only a value to the positional parameter. A more tricky case is in line 36, where we want to pass -y as a value to the positional parameter a. The case is more tricky since syntactically the argument parser might consider -y as the name of one of the non-positional parameter. Therefore we use -- (double dash) to indicate the end of the block of the non-positional parameters and therefore the value of -y is passed to a. Per default positional parameters are required, and non-positional parameters are optional (they can be left out). By using parameter options, we can as well define positional parameters, which are optional, and non-positional parameters, which are required. puts "x=$x y? [info exists y]"
The example in Listing 36 defined method foo with one required and one optional positional parameter. For this purpose we use the parameter options required and optional. The parameter options are separated from the parameter name by a colon. If there are multiple parameter options, these are separated by commas (we show this in later examples). The parameter definition x:required for method foo is equivalent to x without any parameter options (see e.g. previous example), since positional parameters are per default required. The invocation in line 21 of Listing 36 will lead to an undefined variable y in method foo, because no value us passed to the optional parameter. Note that only trailing positional parameters might be optional. If we would call method foo of Listing 35 with only one argument, the system would raise an exception. Similarly, we define method bar in Listing 36 with one required and one optional non-positional parameter. The parameter definition -y:optional is equivalent to -y, since non-positional parameter are per default optional. However, the non-positional parameter -x:required is required. If we invoke bar without it, the system will raise an exception. Optional parameters might have a default value. This default value is used, when no argument is provided for the corresponding parameter. Default values can be specified for positional and non-positional parameters. In order to define a default value for a parameter, the parameter specification must be of the form of a 2 element list, where the second argument is the default value. See for an example in Listing 37. NX provides value constraints for all kind of parameters. By specifying value constraints a developer can restrict the permissible values for a parameter and document the expected values in the source code. Value checking in NX is conditional, it can be turned on or off in general or on a per-usage level (more about this later). The same mechanisms can be used not only for input value checking, but as well for return value checking (we will address this point as well later). NX comes with a set of built-in value constraints, which can be extended on the scripting level. The built-in checkers are either the native checkers provided directly by the Next Scripting Framework (the most efficient checkers) or the value checkers provided by Tcl through string is …. 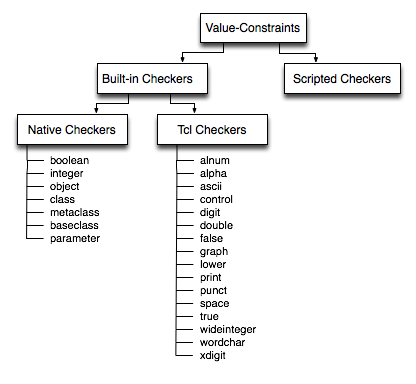 The built-in checkers have as well the advantage that they can be used also at any time during bootstrap of an object system, at a time, when e.g. no objects or methods are defined. The same checkers are used as well for all C-implemented primitives of NX and the Next Scripting Framework. Figure 38 shows the built-in general applicable value checkers available in NX, which can be used for all method and configure parameters. In the next step, we show how to use these value-checkers for checking permissible values for method parameters. Then we will show, how to provide more detailed value constraints. puts "x=$x o? [info exists o]"
Value constraints are specified as parameter options in the parameter specifications. The parameter specification x:integer defines x as a required positional parameter which value is constraint to an integer. The parameter specification o:object,optional shows how to combine multiple parameter options. The parameter o is an optional positional parameter, its value must be an object (see Listing 39). Value constraints are specified exactly the same way for non-positional parameters (see method bar in Listing 39). The native checkers object, class, metaclass and baseclass can be further specialized with the parameter option type to restrict the permissible values to instances of certain classes. We can use for example the native value constraint object either for testing whether an argument is some object (without further constraints, as in Listing 37, method foo), or we can constrain the value further to some type (direct or indirect instance of a class). This is shown by method work in Listing 40 which requires the parameter -person to be an instance of class Person and the parameter -project to be an instance of class Project. The set of predefined value checkers can be extended by application programs via defining methods following certain conventions. The user defined value checkers are defined as methods of the class nx::Slot or of one of its subclasses or instances. We will address such cases in the next sections. In the following example we define two new value checkers on class nx::Slot. The first value checker is called groupsize, the second one is called choice. # Value checker named "groupsize"
error "Value '$value' of parameter $name is not between 1 and 6"
error "Value '$value' of parameter $name not in permissible values $arg"
In order to define a checker groupsize a method of the name type=groupsize is defined. This method receives two arguments, name and value. The first argument is the name of the parameter (mostly used for the error message) and the second parameter is provided value. The value checker simply tests whether the provided value is between 1 and 3 and raises an exception if this is not the case (invocation in line 36 in Listing 41). The checker groupsize has the permissible values defined in its method’s body. It is as well possible to define more generic checkers that can be parameterized. For this parameterization, one can pass an argument to the checker method (last argument). The checker choice can be used for restricting the values to a set of predefined constants. This set is defined in the parameter specification. The parameter a of method bar in Listing 41 is restricted to the values red, yellow or green, and the parameter b is restricted to good or bad. Note that the syntax of the permissible values is solely defined by the definition of the value checker in lines 13 to 17. The invocation in line 39 will be ok, the invocation in line 40 will raise an exception, since pink is not allowed. If the same checks are used in many places in the program, defining names for the value checker will be the better choice since it improves maintainability. For seldom used kind of checks, the parameterized value checkers might be more convenient. Multiplicity is used to define whether a parameter should receive single or multiple values. A multiplicity specification has a lower and an upper bound. A lower bound of 0 means that the value might be empty. A lower bound of 1 means that the parameter needs at least one value. The upper bound might be 1 or n (or synonymously *). While the upper bound of 1 states that at most one value has to be passed, the upper bound of n says that multiple values are permitted. Other kinds of multiplicity are currently not allowed. The multiplicity is written as parameter option in the parameter specification in the form lower-bound..upper-bound. If no multiplicity is defined the default multiplicity is 1..1, which means: provide exactly one (atomic) value (this was the case in the previous examples). Listing 42 contains three examples for positional parameters with different multiplicities. Multiplicity is often combined with value constraints. A parameter specification of the form x:integer,0..n means that the parameter x receives a list of integers, which might be empty. Note that the value constraints are applied to every single element of the list. The parameter specification x:integer,0..1 means that x might be an integer or it might be empty. This is one style of specifying that no explicit value is passed for a certain parameter. Another style is to use required or optional parameters. NX does not enforce any particular style for handling unspecified values. All the examples in Listing 42 are for single positional parameters. Certainly, multiplicity is fully orthogonal with the other parameter features and can be used as well for multiple parameters, non-positional parameter, default values, etc. Optional object and method parameters can set a default value. Recall that default values can be specified for positional and non-positional parameters, alike. This default value is used to define a corresponding method-local and object variable, respectively, and to set it to the default value. By default, the default value is taken literally (without any substitutions). Default values can also be preprocessed into a final value using Tcl substitution as provided by the Tcl [subst] command. To control the kind of substitutions to be performed, the parameter option substdefault can be provided. # set at instantiation time. the specification for the initialization of objects. We refer to the first two as method parameters and the last one as configure parameters. The examples in the previous sections all parameter specification were specifications of method parameters. Method parameters specify properties about permissible values passed to methods. The method parameter specify how methods are invoked, how the actual arguments are passed to local variables of the invoked method and what kind of checks should be performed on these. Configure parameters are parameters that specify, how objects can be parameterized upon creation. Syntactically, configure parameters and method parameters are the same, although there are certain differences (e.g. some parameter options are only applicable for objects parameters, the list of object parameters is computed dynamically from the class structures, object parameters are often used in combination with special setter methods, etc.). Consider the following example, where we define the two application classes Person and Student with a few properties. The class Person has two properties name and birthday, where the property name is required, the property birthday is not. The class Student is a subclass of Person with the additional required property matnr and an optional property oncampus with the default value true (see Listing 44). 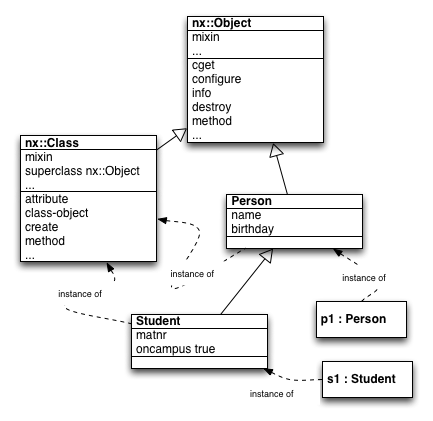 The class diagram below visualizes these definitions. In NX, these definitions imply that instances of the class of Person have the properties name and birthday as non-positional object parameters. Furthermore it implies that instances of Student will have the configure parameters of Person augmented with the object parameters from Student (namely matnr and oncampus). Based on these configure parameters, we can create a Person named Bob and a Student named Susan with the matriculation number 4711 (see line 23 and 24 in <<xmp-object-parameters, instance variables name, matnr and oncampus (the latter is initialized with the default value). The configure parameters are not limited to the application defined properties, also NX provides some predefined definitions. Since Person is a subclass of nx::Object also the configure parameters of nx::Object are inherited. In the introductory stack example, we used -mixins applied to an object to denote per-object mixins (see Listing 8). Since mixins is defined as a parameter on nx::Object it can be used as an object parameter -mixins for all objects in NX. To put it in other words, every object can be configured to have per-object mixins. If we would remove this definition, this feature would be removed as well. As shown in the introductory examples, every object can be configured via a scripted initialization block (the optional scripted block specified at object creation as last argument; see Listing 5 or Listing 12). The scripted block and its meaning are as well defined by the means of configure parameters. However, this configure parameter is positional (last argument) and optional (it can be omitted). The following listing shows the configure parameters of Person p1 and Student s1. -name /value/ ?-birthday /value/? ?-object-mixins /mixinreg .../? ?-class /class/? ?-object-filters /filterreg .../? ?/__initblock/? ?-birthday /value/? ?-object-mixins /mixinreg .../? ?-class /class/? The listed configure parameter types mixinreg and filterreg are for converting definitions of filters and mixins. The last value __initblock says that the content of this variable will be executed in the context of the object being created (before the constructor init is called). More about the configure parameter types later. Since classes are certain kind of objects, classes are parameterized in the same way as objects. A typical parameter for a class definition is the relation of the class to its superclass.In our example, we have specified, that Student has Person as superclass via the non-positional configure parameter -superclass. If no superclass is specified for a class, the default superclass is nx::Object. Therefore nx::Object is the default value for the parameter superclass. Another frequently used parameter for classes is -mixins to denote per-class mixins (see e.g. the introductory Stack example in Listing 10), which is defined in the same way. Since Student is an instance of the meta-class nx::Class it inherits the configure parameters from nx::Class (see class diagram Figure 45). Therefore, one can use e.g. -superclass in the definition of classes. Since nx::Class is a subclass of nx::Object, the meta-class nx::Class inherits the parameter definitions from the most general class nx::Object. Therefore, every class might as well be configured with a scripted initialization block the same way as objects can be configured. We used actually this scripted initialization block in most examples for defining the methods of the class. The following listing shows (simplified) the parameters applicable for Class Student. ?-superclass /class .../? ?-mixins /mixinreg .../? ?-filters /filterreg .../? ?-object-mixins /mixinreg .../? More detailed definition of the configure parameter types comes here. puts "Unknown method '$called_method' called"
# Output will be: "Unknown method 'foo' called"
Without any provision of an unknown method handler, an error will be raised, when an unknown method is called. The next scripting framework provides in addition to unknown method handlers also a means to dynamically create objects and classes, when these are referenced. This happens e.g. when superclasses, mixins, or parent objects are referenced. This mechanism can be used to implement e.g. lazy loading of these classes. Nsf allows one to register multiple unknown handlers, each identified by a key (a unique name, different from the keys of other unknown handlers). puts "***** __unknown called with <$name>"
The Next Scripting Framework allows one to add, query, delete and list unknown handlers. U. Zdun, M. Strembeck, G. Neumann: Object-Based and Class-Based Composition of Transitive Mixins, Information and Software Technology, 49(8) 2007 . G. Neumann and U. Zdun: Filters as a language support for design patterns in object-oriented scripting languages. In Proceedings of COOTS’99, 5th Conference on Object-Oriented Technologies and Systems, San Diego, May 1999. G. Neumann and U. Zdun: Implementing object-specific design patterns using per-object mixins. In Proc. of NOSA`99, Second Nordic Workshop on Software Architecture, Ronneby, Sweden, August 1999. G. Neumann and U. Zdun: Enhancing object-based system composition through per-object mixins. In Proceedings of Asia-Pacific Software Engineering Conference (APSEC), Takamatsu, Japan, December 1999. G. Neumann and U. Zdun: XOTCL, an object-oriented scripting language. In Proceedings of Tcl2k: The 7th USENIX Tcl/Tk Conference, Austin, Texas, February 2000. G. Neumann and U. Zdun: Towards the Usage of Dynamic Object Aggregations as a Form of Composition In: Proceedings of Symposium of Applied Computing (SAC’00), Como, Italy, Mar 19-21, 2000. G. Neumann, S. Sobernig: XOTcl 2.0 - A Ten-Year Retrospective and Outlook, in: Proceedings of the Sixteenth Annual Tcl/Tk Conference, Portland, Oregon, October, 2009. J. K. Ousterhout: Tcl: An embeddable command language. In Proc. of the 1990 Winter USENIX Conference, January 1990. J. K. Ousterhout: Scripting: Higher Level Programming for the 21st Century, IEEE Computer 31(3), March 1998. D. Wetherall and C. J. Lindblad: Extending Tcl for Dynamic Object-Oriented Programming. Proc. of the Tcl/Tk Workshop '95, July 1995.